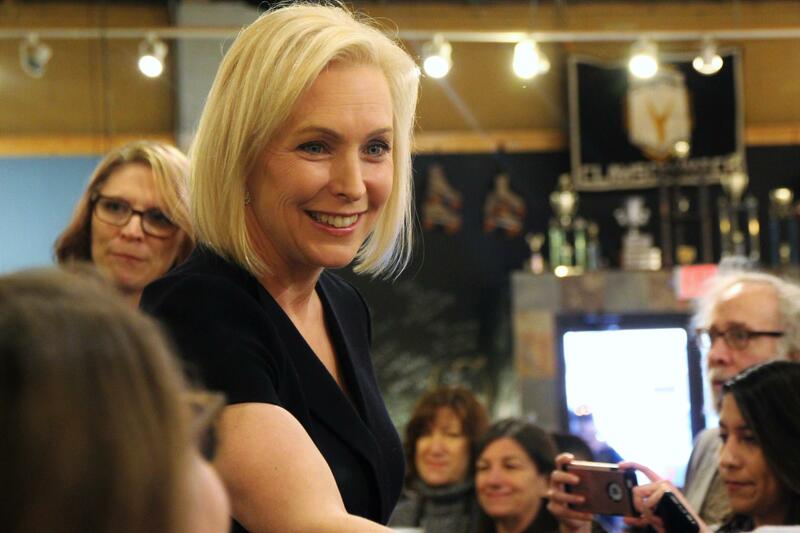 New York Senator Kirsten Gillibrand made a campaign stop in Metro Detroit Monday evening. With a crowded, noisy field of 2020 hopefuls and a long primary race ahead, Gillibrand’s stump speech is meant to make Democratic voters feel like they just had a really good first date: plenty of progressive battle cries to spark some excitement, but enough talk about “common sense” appeal to seem like a keeper. “The reason why I’m going to beat President Trump is this: my story,” Gillibrand said, describing her successful congressional campaigns in red districts, up against attack ads as a young mom with a toddler and infant in tow. “I won that campaign by a 24-point margin. So the reason why I will defeat President Trump is my entire time in Congress, I have chosen to bring people together. I have chosen to reach across the aisle to get things done, even in the last Congress, a Republican House, Senate, President – I got 18 bills passed. Even with Ted Cruz!” she said to applause. “No person in this state, in this country, should be able to turn on the water and not know that that water is safe. For those families living in Flint, Michigan, that’s about institutional racism. For those families that live with PFAS in their waters, that’s about a lack of care; it’s about corporate greed,” she said. Gillibrand took questions from the audience, including one from Jamila Carrington Smith of Beverly Hills. Afterward, Senator Gillibrand spoke to reporters about her plan to make higher education more affordable. One idea, she says, is a new spin on the GI bill: If you do community service for a year, you get two years free tuition at a community college or state school. Do two years, and get four years free. Carrington Smith, the voter who asked Gillibrand about her electability, said she was pleasantly surprised by Gillibrand. This piece was edited on March 19, 2019 to clarify Gillibrand's statement about poisoned water. Texas Democrat Beto O'Rourke packed the Hometown Heroes coffeehouse in Centerline on Monday. O'Rourke was the first Democratic presidential hopeful to make a campaign stop in Michigan. Some of those in the crowd had already decided that O'Rourke was their favorite candidate, like Barb Sudomier. Fresh off statewide defeats in 2018, Michigan’s Republican Party picked new leadership Saturday. “Are you ready to win in 2020!” National Republican Party Chair Ronna Romney-McDaniel said as she rallied the state GOP convention in Lansing. The party needs rallying after losing races for governor, attorney general, and secretary of state in 2018. Republicans held onto control of the state Senate and House but by slimmer margins. Organizers expect thousands of Michiganders will take part in rallies across the state tomorrow in support of President Trump. Anti-Trump protests have dominated the news for months. Michigan rally organizer Meshawn Maddock says this weekend’s events are intended to show the president is “loved." Michigan Democrats will hold their state party convention in Lansing on Saturday. This weekend’s convention may end up reflecting former presidential candidate’s Bernie Sanders' policies as much as party presidential nominee Hillary Clinton.